Trump Names His Budget Chief As Interim Head Of Consumer Protection Agency : The Two-Way President Trump named Mick Mulvaney as acting director of the Consumer Financial Protection Bureau on Friday, the same day outgoing director Richard Cordray named his own interim successor. Mick Mulvaney, director of the Office of Management and Budget, was on Friday named acting director of the Consumer Financial Protection Bureau by President Trump. But before resigning earlier in the day, CFPB Director Richard Cordray had named Leandra English to be his interim successor. 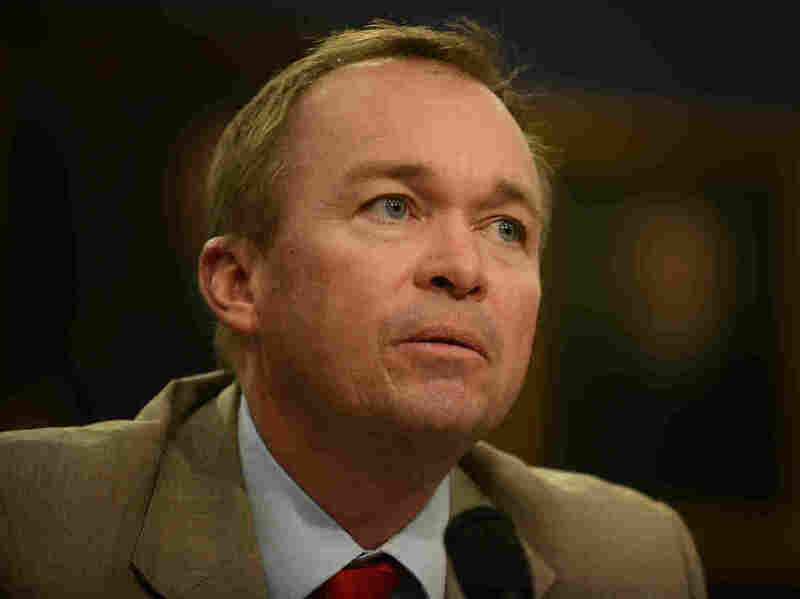 President Trump on Friday announced that Mick Mulvaney would become acting director of the Consumer Financial Protection Bureau, hours after outgoing Director Richard Cordray tapped his own interim successor. Earlier Friday, the CFPB announced that Cordray had named Leandra English, the agency's chief of staff, as deputy director to take over the bureau. Cordray, who announced he would be stepping down by the end of November, officially tendered his resignation on Friday. "It has been one of the great joys of my life to have had the opportunity to serve as the first director of the Consumer Bureau for the past six years," he wrote in a letter to Trump. The White House said in a statement that Mulvaney, director of the White House Office of Management and Budget, will serve as acting director until a permanent director is nominated and confirmed by the U.S. Senate. "The President looks forward to seeing Director Mulvaney take a common sense approach to leading the CFPB's dedicated staff, an approach that will empower consumers to make their own financial decisions and facilitate investment in our communities," the White House said. But Sen. Elizabeth Warren, who helped create the CFPB, tweeted Friday night that under the Dodd-Frank financial reform law, "the [agency's] Deputy Director becomes Acting Director. @realDonaldTrump can't override that." Cordray, who has been a tough regulator of banks and other financial institutions, has been a frequent target of Republican lawmakers. In April, Rep. Jeb Hensarling, R-Texas, who chairs the House Financial Services Committee, called for Cordray to be fired. The CFPB ordered Wells Fargo to pay $185 million in fines and penalties for secretly opening accounts that had not been authorized by customers. "We have returned almost $12 billion to more than 30 million consumers who had been cheated or mistreated by banks or other large financial companies," Cordray wrote in his resignation letter.